ON A BRANCH OF THE PERUVIAN CENTRAL RAILWAY, near Morococha, the railway reaches its highest point, 15,865 feet above the sea. The line climbs from Callao, on the Pacific coast, and runs via Lima, the capital of Peru, to Oroya. The most difficult section is from Chosica, about 25 miles from the coast, to the Galera Tunnel, 118 miles farther on, and 15,665 feet above the sea. Henry T. Meiggs, of Philadelphia, was the engineer originally responsible, but he died before the work had been completed. MANY adventurers, long ago, vanished into the high fastnesses among the Andes in search of reputed natural wealth. Sometimes they returned, sometimes they did not. The Incas of old Peru knew their passes, and built narrow tracks up through the great Andine valleys, spanning the gorges at giddy heights with primitive suspension bridges woven out of osiers. The Incas were the forerunners of the modern engineers who, since the latter part of the nineteenth century, penetrated the innermost recesses of the Andes, first with pack mules and surveying instruments, then with their railroads and bridges. Tragedy has seemed to dog the work of the engineer in his efforts to conquer these mountains. Sometimes the engineers have prevailed; sometimes the mountains have held them at bay for years; and sometimes, it seems, some strange elemental spirit in the mountains has waited until man has perfected his invading works, and then has destroyed them at one blow. The oldest constructive scheme for building a railway through the heart of the Andes, surmounting altitudes never before attempted, was drawn up by Henry T. Meiggs, an American engineer. The history of the attempt is inevitably bound up with the romantic and tragic story of Meiggs himself. Henry T. Meiggs was born in Philadelphia in 1811, and from youth upwards showed increasing promise of becoming a remarkable figure in the world of transport and trade. He arrived in the republic of Chile in 1854, and within the following decade had made a reputation as a railway builder of extra-ordinary capability. This he gained by building a line between Santiago and Valparaiso, to the order of the Chilean Government. The route was not easy, and several attempts had already been made on it by successive contractors, all of whom had been overwhelmed by bankruptcy. The mountains of South America had already baffled and reduced to ruin and despair many engineers of repute. The Chilean Government offered the ambitious Meiggs 12,000,000 dollars (about £2,400,000) to complete the works of the Santiago-Valparaiso Railroad. He undertook the contract and completed it in two years, half the time allowed him by the Government. Moreover, he emerged from the enterprise with a handsome profit. His reputation, already made and lost in his home country, was assured in the South American republic. In 1868 the Government awarded him the contract for carrying a line of railway from Mollendo to Arequipa, and this was followed by contracts to continue it from Arequipa to Lake Titicaca, crossing the Cordilleras at a height of 14,668 feet, with a connecting line to the old Inca capital of Peru, at Cuzco. It is typical of Meiggs’s character that he celebrated the awarding of these contracts by entertaining the President of the Republic and two thousand other guests to a banquet. This, then, was the man who was chosen to build the great route into the heart of the Andes, the Callao, Lima and Oroya Railway, which to this day remains the highest standard-gauge main-line railway in the world. The building was a colossal task, but the line, now known as the Peruvian Central Railway, remains a monument to Meiggs’s courage and skill. At its summit-level the line reaches an altitude of 15,865 feet above the sea. Meiggs contracted to build this amazing railway, attaining its great altitudes within a relatively short distance from the coast, as a means of connecting the mines at Oroya with the sea at Callao, close to Lima. His ambitions, however, went much farther than this. He visualized his railway stretching right across the great chain of the Andes into the Amazon Basin beyond, down the Amazon Valley to a point where the river was navigable for the largest ocean-going steamers. He imagined a transcontinental route which would put an end to the hazardous business of rounding the Horn - in those days the only practicable way of reaching the Pacific Coast from the great cities of Brazil and Argentina. This was to be no makeshift railway, but a well-planned, well-built standard-gauge artery, equal in carrying power to the Pacific Railroads in the United States, and far overshadowing them in the boldness of its conception. Meiggs began his huge task in 1870, and at the end of a year had finished fifty miles of grading and embankments, twenty miles from the seaward end having been already metalled. This was comparatively easy going, though the route rose from the coast without a single level section. Meiggs carried the route up the Rimac Valley into the Cordilleras and at Chosica, a bare twenty-five miles or so from the coast, had reached an altitude of 2,821 feet above sea level. The situation of Chosica resembles a gateway into the heart of the mountains; for beyond it the valley widens out again. Up this, Meiggs took his track until the colour and luxuriance of tropical trees had been left behind, and he was faced with the full resistance of the mountains to his penetrative efforts. In those days the constructional engineer, in such a region as this, had little means at his disposal for excavating and grading his road. This had to be done in advance of the laying of the permanent way. The engineers had no huge mechanical excavators such as we know, and their means of local transport consisted of mules and pack llamas. At a point some forty-six miles from his starting-place Meiggs was faced with a solid mountain wall, which most engineers would have given up all thought of scaling. It was impossible to drive a tunnel through the mountain, for there was nowhere for it to emerge on the other side. Far above the level of the railhead, however, a parallel ridge scored the face of the giant cliff. INSPECTION CAR near Viso, on the Peruvian Central Railway. The notice “Pito” means “Whistle”. The Peruvian Central Railway, which is built to the standard gauge of 4 ft 8½-in, was begun by Meiggs in 1870. The route from the Pacific coast to Chosica was relatively easy; but, beyond Chosica the American engineer was faced with the mountain barrier. This he conquered by means of the zigzag development known as the Meiggs V-switch. To reach this ledge the engineer used for the first time a development which became known as Meiggs’s V-switch. He took the track as far up and along the face of the mountain as he could, and then took it backwards and upwards in a zigzag traverse until it reached the ledge above. The train negotiates a V-switch by the simple process of reversing. Having reached a dead end, the locomotive is coupled up to the other end of the train, and then toils on along the uppermost tail of the V. As he proceeded into the heart of the mountains, Meiggs was often to adopt this means of climbing to a higher level within a short distance. Up and up he carried his grading, blasting his way through outcrops on the mountainside, building out terraces to bear the line across the flanks of slopes which were little less than precipices. Other natural difficulties began to assail the line. Mountain sickness, or sorroche, which resembles sea-sickness and is equally distressing, assailed most people coming up from the coast. It is caused by the tenuity of the atmosphere at high altitudes. Disease of another kind, however, was to attack the plucky toilers, with far more terrible results. Some fifty-three miles from the coastal terminus it was necessary to throw a span across the Verrugas Canyon. The bridge was to be 575 feet long, and the river in the bottom of the canyon was 252 feet below the level of the road bed, the superstructure being supported in the middle by a huge masonry pier 50 feet square at the base. Beset by tremendous difficulties, Meiggs and his men had half finished this difficult work, which was carried out at a height of 6,000 feet above sea level, when a strange illness began to attack the workers. Nobody then knew what it was, but it claimed its victims from native and white man alike. The disease is now known to be due to a parasitic worm living in water. Had this illness struck Meiggs, it is probable that the work would have remained unfinished, but, finding himself immune, he never slackened his will. As the men died before his eyes, he offered higher and higher wages to all who would come and brave the risk. He succeeded. The bridge was built. Master and men pushed on through the mountains. The farther they went, the greater grew the odds against them. It is said that at this stage they were using 500,000 lb of explosive a month to blast the way before them. Tunnel after tunnel they bored, and V-switch after V-switch stepped the line up the sides of the mountains. Within a space of fifty miles, they pierced the outflung flanks of the mountains with nearly sixty tunnels. A little beyond San Mateo they had to carry the track across the aptly-named Infiernillo (“Little Hell”) Gorge. It was flanked on either side by perpendicular walls of rock. Meiggs had to pierce these walls with two tunnels. Between the tunnels he used suspended cradles for the men engaged in building the bridge, for there was no foothold whatever on the sides of the cliffs. Immediately beyond this place, he found only one possible path, and that was occupied by a surging mountain torrent. He bored out a tunnel at a lower level to take the flow of the waters, and then founded his road on the dry river-bed. By 1877 Meiggs and his brave workmen had reached Chicla, some eighty-seven miles from the coast, in the course of which they had carried the track to an altitude of 12,250 feet above the level of the Pacific. It was then that tragedy occurred. The continued exercise of his will-power, the strain of incessant overwork, and perhaps as much as anything the dearly-bought conquest of the Verrugas Canyon, broke even the iron constitution of the master engineer. Desperately ill, he was hurried down to Lima. There he died, on September 29, 1877. The spirit of the enterprise was gone. Two years later war broke out between Peru and Chile, and the few half-hearted efforts at completion which had continued ceased abruptly. For eleven years the works remained virtually derelict, an apparent failure. Then they were bought by the Peruvian Corporation, which still operates them, and which installed another Philadelphian, William Thorndyke, in charge of operations. From Chicla the new chief carried the line up a tremendous quadruple switchback, by which it climbed 644 feet within a space of three-fifths of a mile. The length of the tracks up this switchback was a little over three miles. Thorndyke pushed on along the way mapped out by Meiggs, at one place bringing his track out on the mountainside nearly 1,000 feet above its lower level, the two tracks being plainly visible from each other. Finally, at a height of 15,665 feet above sea level, he pierced the watershed of the Andes with the now world-famous Galera Tunnel, through a hard mountain mass nearly a mile across. With blasting and drilling the men went to work, while mountain sickness, severe at this great altitude, did its best to conquer them. The middle of the Galera Tunnel marked the summit of their line; they had reached the edge of the Amazon Basin. The tunnel thus drains into the Pacific on the one side and into the Atlantic on the other. The bitterest struggles were over, and it was with relative ease, once the tunnel was pierced from end to end, that they carried their line down the valley of the Yauli, one of the innumerable tributaries of the Amazon into Oroya, 12,225 feet above sea level. 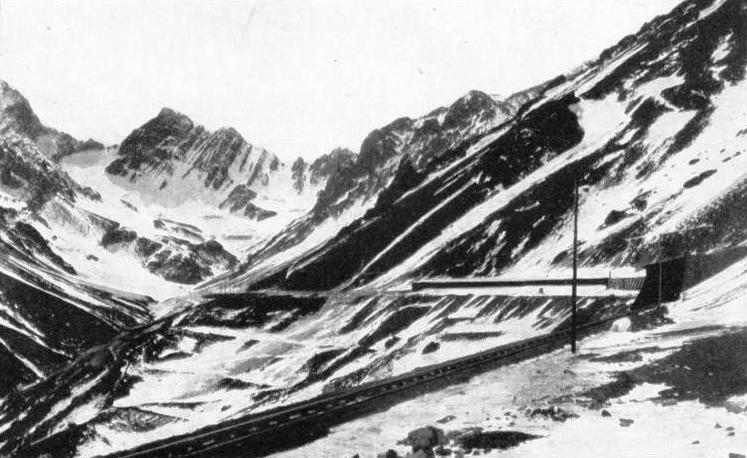 The first great highway across the watershed of the Andes was complete at last. One of the peaks of the huge range was named Mount Meiggs, but the true monument to Henry T. Meiggs, finished by Thorndyke in the year 1893, was the Callao-Oroya Railway, for which Meiggs had given his fortune, his health and in the end his life. Modern developments of this route include a branch from Ticlio to Pachachaca, reaching the maximum summit-level of 15,865 feet. From Oroya, too, an extension was built to Huancayo in 1908. Thus this great work, brought into existence after so much exertion, continues to-day, a busy artery for the traffic in copper from the Oroya mines to the coast. Where once sounded the detonations of blasting, the silences of the Andes are now broken only by the deep whistle and sharp exhaust of a locomotive climbing up to the Galera Tunnel. If the history of the Callao and Oroya line met tragedy in its building and triumph in its completion, that of the Transandine Railway from Argentina into Chile has shown a reversal of the process. In this instance, the engineers seemed to have conquered Nature, when Nature hit back. 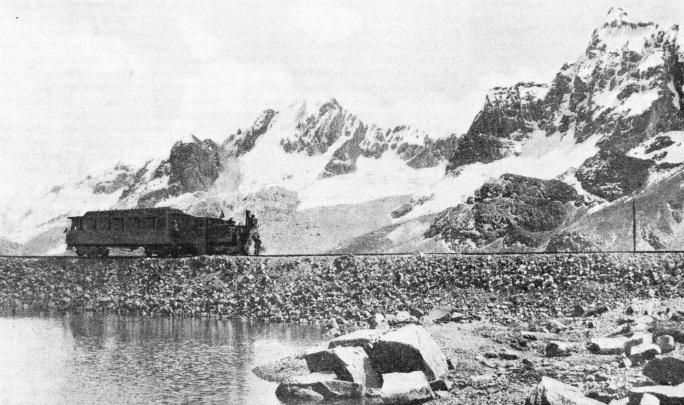 A TRAIN ON THE OLD VISCAS BRIDGE, near the 175th kilometre post (109 miles from the coast), on the Peruvian Central Railway. This bridge, built in 1892, had a span of 178 feet. When Meiggs died in 1877, the track had been carried to a height of 12,250 feet above sea level, and had reached Chicla, 87 miles from the coast. In 1888 the Peruvian Corporation bought the unfinished railway, and appointed another Philadelphian, William Thorndyke, to complete it, to Oroya. The builders of the Transandine succeeded in attaining the goal aimed at by Meiggs - the linking of the Atlantic and Pacific coasts of South America by a continuous medium of transport, so that traffic between the countries east and west of the Andes would no longer have to be conducted round Cape Horn or up and over the Isthmus of Panama. The engineers of the Argentine Transandine Railway began operations in 1886, with Mendoza for their starting-point. Mendoza was the terminus of the broad-gauge railway which came across the pampas from Buenos Aires. Mendoza was also at one end of the old mule track which crossed the formidable Cumbre Pass through the Andes and went down into Chile. As Henry Meiggs found a gateway to the Cordillera range in Chosica, so did the builders of the Transandine find in Mendoza a gateway to the eastern flanks of the main backbone of the Andes. Having forced their way up into the mountains, the men followed the precipitous gorge of the Mendoza River, braving its periodical floods when the snows melted, and building out fortifications against the river while it was low and relatively powerless. Again and again the floods came down, sweeping away large stretches of the newly-built embankment., so that the engineers had to wait until the spate was finished and then begin their task all over again. No ordinary embankment or retaining wall could keep this wild river in check, and not until enormous embankments, containing thousands of tons of rock, had been built, did the works seem destined to attain any measure of success. NEAR CARACOLES, between the 67th and 68th kilometre posts (42 miles from the coast), on the Chilian Transandine Railway. 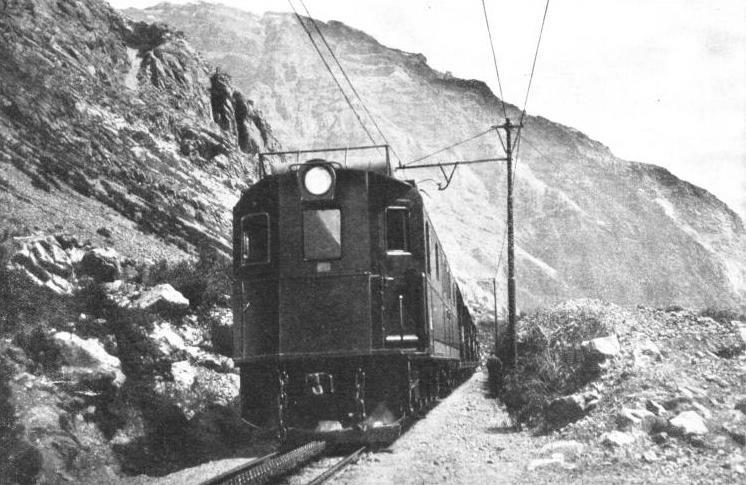 On the Chilean side, a railway already ran from Valparaiso on the Pacific Coast, to Los Andes. This railhead was 8,000 feet below the level which the Transandine Railway would have to obtain before piercing the watershed. The Chileans adopted the V-switch development initiated by Meiggs in Peru, and zigzagged their line up the mountainside in a series of terraces and galleries. In the first seven miles to the summit the line climbed 3,150 feet, with gradients of 1 in 12½. The higher the builders went into the mountains, the greater became their difficulties. To the fierce vagaries of the mountain river were added huge bogs and morasses which swallowed enormous quantities of spoil taken from other parts of the route. The engineers drained the bogs, dumped hurdles into them, and drove great successions of piles into the spongy ground. The works were continually overwhelmed by avalanches of rock and huge snowslides. There above them, in places, lay enormous banks of screes - masses of loose rock, brought down from the mountains by natural erosion over a very long period - which needed only a slight disturbance to bring them slipping down on the workings below. To deal with the screes, the engineers built gigantic concrete and masonry retaining walls. Against the constant menace of snowslides they set up great snow-sheds, or tunnels, over long stretches of their nascent railroad. In the narrow gorge of the Mendoza River, it was often impossible to continue on the same side as that by which they had come. It then became necessary for the engineer to sling his track on a dizzy steel span across the swirling torrent on to the opposite bank of the river. The natural law of erosion assisted him here, for a river, carving out a perpendicular wall on the outside of its curving course, naturallv leaves a more gentle shore behind it on the inside of the curve. Only occasionally does it force its way through a narrow gorge, both sides of which rise up sheer from the waters. All the time, while they were forcing their way through the unyielding natural fortifications of the Eastern Andes, the builders of the Transandine Railway were climbing steadily and sharply. Although their starting point was 650 miles from the Atlantic coast, the rise across the pampas had been negligible. Mendoza, the gateway to the second highest range in the world, is only 2,470 feet above sea level - lower than some summits of the Pennine Chain in England, which is nowhere far from the sea. But in the last eight miles alone, the builders of the Transandine carried their line up 8,042 feet. As in Peru, the workmen at these great heights were assailed by mountain sickness in its most virulent form, which caused intense suffering. THE RAILWAY LINK BETWEEN ARGENTINA AND CHILE. From the Argentine side the Argentine Transandine Railway climbs from Mendoza, 2,470 feet above sea level, up the gorge of the Mendoza River. Beyond Puente del Inca, the Inca’s Bridge, the line tunnels under the Cumbre Pass, reaching a height of 10,512 feet above the sea. On the Chilean side the Chilian Transandine Railway climbs from Los Andes to the tunnel. The builders of the Transandine Railway were not paving the way for a full-size standard-gauge railway. Henry Meiggs, impetuous and ambitious, had insisted on building a line comparable to any other main line in its equipment. For the Transandine, however, the narrower gauge of one metre (3 ft 3⅜-in) was adopted instead of the 4 ft 8½-in gauge. This enabled the builders of the newer line to carry their grading round much sharper curves as they forced their way up the winding valley of the Mendoza. When the engineers had reached a point a little less than 8,000 feet above sea level, they were obliged to call a halt. This was at Puente del Inca - the Inca’s Bridge - a name commemorating a natural bridge used long before the coming of the white man with his mechanical inventions. 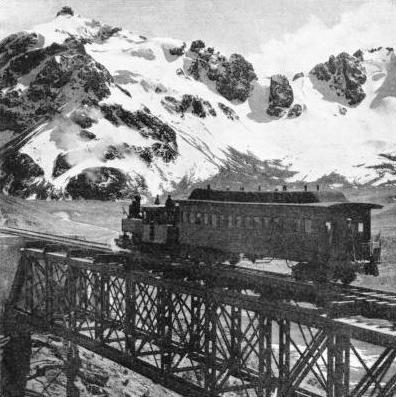 Thus, for a number of years, passengers and merchandise passing over the Andes had to be trans-ferred from the train to the old-time mule cavalcade, which crossed the Cumbre Pass between Argentina and Chile. The builders of the railroad realized that it was impossible to carry their track over this terrible summit. There was no alternative but to bore their way through the mountain. Meanwhile progress was being made on the Chilean side of the pass. A Chilean railway already extended as far as Los Andes. But Los Andes was 8,000 feet below the level which the Transandine Railway would have to attain before piercing the watershed. The Chileans repeated the process initiated by Meiggs up in Peru, and stepped their track up the mountainside in a succession of stupendous terraces and galleries, climbing 3,150 feet in the final seven miles, with gradients of 1 in 12½. It was not possible to use ordinary railway rolling stock on such gradients, and on both sides the permanent way rising to the tunnel was frequently equipped with a central triple rack, in which pinion wheels mounted on the locomotives engaged as the trains entered heavy sections. The year 1906, twenty years after the first steps had been taken in building the Transandine Railway, saw the work still unfinished, but it was in that year that the Argentine and Chilean engineers began, simultaneously, to pierce the intervening mountain wall from opposite sides. There were some two miles of solid rock between them. This was not a great distance compared with some of the distances which had been overcome in other mountainous countries, but here the rock was of such a nature that it crumbled almost immediately it was exposed to the atmosphere. The men in the workings had to line their tunnel with Portland cement as they proceeded. Their rate of progress averaged not more than 7 feet a day. Now and then they would strike some underground fissure from which an unsuspected spring would gush forth, flooding the workings and perhaps ruining days of work. Veins of loose earth occurred here and there in the rock strata, sending showers of soil on to the heads of the workers. The process of drilling the rock face, inserting the charge, firing it, and clearing away the fallen debris might take anything up to ten hours. The advance would be about two feet. Outside the tunnel the workers had been subjected to the chilly air of the great altitude, but here they worked in an oppressive heat. 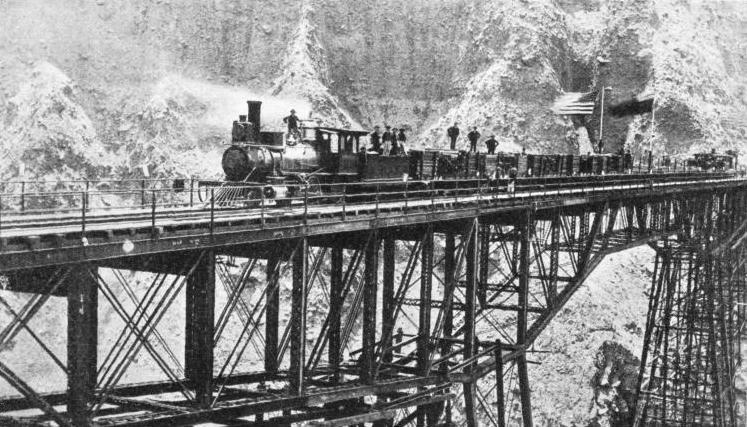 OPENING OF THE OLD BRIDGE ACROSS THE VERRUGAS CANYON, about 53 miles from the coastal terminus of the Peruvian Central Railway. The bridge, which was built by Henry T. Meiggs, was 575 feet long, and the road bed was 252 feet above the bottom of the chasm. The superstructure was supported in the middle by a huge masonry pier 50 feet square at the base. The engineers persevered, despite these arduous conditions, and despite the heavy mortality that assailed them through accident and sickness. On November 27, 1909, the engineers from the Argentine and Chilean sides joined hands in the middle of the mountain, 10,512 feet, or nearly two miles, above sea level. So exact had been their survey that their centre lines disagreed by only three inches. On April 5, 1910, twenty-four years after the first steps in the building of the railway had been taken, through communication by rail was established between Chile and the Argentine Re public. The length of the Argentine Transandine Railway was 111 miles; that of the Chilean section, forty-six miles. The Atlantic Coast of Argentina had been brought within less than two days' journey of the Pacific Coast of Chile. Improvements in traction were soon made. Strange articulated locomotives of great power were shipped out from Great Britain and set to work on the steeply-graded tracks. The Chilean Government electrified their section in the summer of 1927, drawing their power from the mountain rivers which had formerly all but daunted them. The old mule track was improved out of all recognition into a road capable of carrying modern motor cars. Then, on the night of January 10. 1934, came the tragedy of the Transandine. It was stated that a cloud burst over Mount Tupungato had caused a spate, and had sent a huge wave down the Mendoza River, already swollen by previous floods. This was serious enough, for the river drops more than 7,500 feet between Las Cuevas and Mendoza in the course of about 100 miles. It was stated also that a number of bridges and culverts had been washed away, and several stretches of permanent way and roadway destroyed. Rumours hinted at worse things. Then detailed reports from people on the spot came through. The electric power station at Cacheuta had been swamped by a wall of water and rock, flooding it to a depth of more than 60 feet. There had been an avalanche as well as a cloudburst. Not until men. at great hazard, had penetrated far up into the mountains was the extent of the disaster really known. 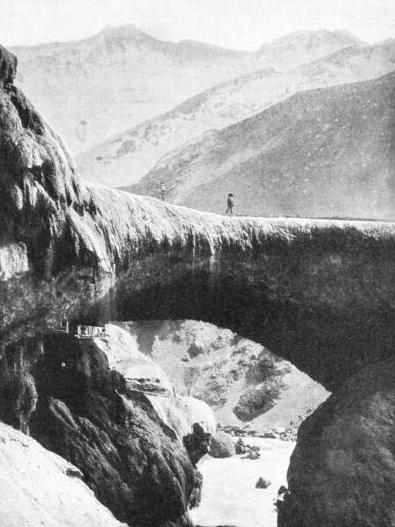 PUENTE DEL INCA, or the Inca’s Bridge, a natural bridge at the beginning of the dreaded Cumbre Pass between Argentina and Chile. The Inca's bridge is situated nearly 8,000 feet above sea level. For several years through passengers had to leave the railhead here, and transfer to the mule cavalcade over the pass. 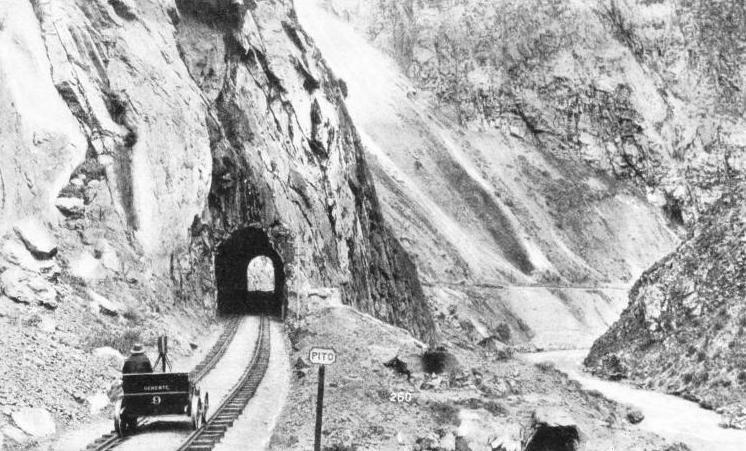 The engineers, having realized that it was impossible to carry the railway over the pass, built a tunnel two miles long beneath it. On November 27, 1909, the engineers from the Argentine and Chilean sides joined hands in the middle of the mountain. At the head of the River Plomo, the waters of which fed the Mendoza through its principal tributary, the Tupungato River, a glacier had collapsed, releasing a wall of water 80 feet high which had swept down the Mendoza Valley carrying the entire spate of snow-water before it. There had fortunately been little loss of life. But on the Transandine Railway, which had taken nearly a quarter of a century to build, the damage was greater. Between Kilo-metre Posts 126 and 133 the railway, road, and all their earthworks and culverts had vanished utterly. There was not a sign of them. At Kilometre 58 a steel bridge 246 feet long had been lifted from its abutments and carried 765 yards downstream as if it were a bundle of bamboo poles. A similar bridge at Potrerillos had suffered the same fate, its remains being found 547 yards down the river. Five spans of the bridge at Kilometre 24, each span 65½ feet long, had completely disappeared. Altogether the line had been breached in thirty-nine places, and as means of transport was completely wrecked. For a while, nothing could be done. Until the freshets had died down the Mendoza Valley remained dangerous. Then, in August of the same year, a start was made with putting the road into some sort of working order. But it was a tremendous task, great stretches of the highway having suffered the same fate as the railway, and needing to be built all over again. Early in 1937, it was again possible to make the passage of the Andes from Mendoza. Specially equipped motor cars, with all the appliances necessary for high mountain working, made the passage of the precipitous valley from Mendoza to La Vacas. There the broken thread was picked up by trains of the Chilian Transandine Railway, which, since the disaster have been worked across the frontier and through the tunnel. Thus does the engineer carry on in the face of angry Nature.